The Bulldogs are excited to say the snow is clearing and we now how our fields booked so now we need to get everyone in to equipment so we are ready to go! We will be having two days for equipment handout. The first is Tuesday April 23, 2019 at Krown rustproofing on Gormanville road from 6-7. If you can not make that one for whatever reason there will be a second one April 30, same time and place. JV and SV please remember you will need to have a girdle (source for sports has a few options for you if you don’t have one yet). Bantams will receive football pants with pads in them so do not need a girdle. Below is a list of practices for the May Training camp leading up to the first games. Training camp practices will be at Omischl and then start May 22 at Rollie Fisher behind the memorial gardens. I know the training camp is a lot of football but in order to be prepared and have everyone safe and ready to play it is necessary to cram as many in as possible. Bantams get 14 practices before game one, JV gets 11 before game one and SV gets 13 before game one. So please if at all possible try to be at every practice. After training camp and starting May 22 on practices will be on a regular schedule as per below. Reminder of in gym sessions left are April 20 and 27 at Widdifield Bantams 3-4:30, JV 5-6:30 and SV 7-8:30 if you cant make it let me know. Payment reminder- You can email transfer to me at this email, bring cash or cheque to practice or at source for sports by cash cheque debit or credit. And last but not least, please remember to do your OFA football insurance at http://ontariofootball.ca/page.php?page_id=83927 this must be completed before the first game or you can not play. So be sure to get this done ASAP. If you have any questions, feel free to contact your coaches. Welcome to you all! We have many returning players as well newcomers for the 2019 season. First of all, thank you for registering. This post will have lots of information in it for you. PARENT PLAYER MEETING: We will be having a parent/player meeting on Wednesday, February 20th at 6:15 at West Ferris High School in the Auditorium. This information session will tell you a bit about the summer program, what is involved, parents and players will have the opportunity to meet the coaches for the Junior Varsity program for 2019. What we expect from the players, coaches, parents, and everyone involved with the North Bay Bulldogs. If you know of anyone thinking about playing, they are welcome to come out as well. In the end, there will be an opportunity to ask questions you may have. We will go over the player code of conduct which the player must sign. And go over the parent code of conduct. 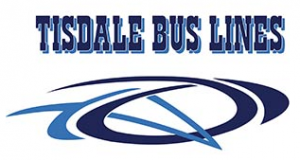 PRESEASON IN GYM SESSIONS: We also have set up our preseason in gym sessions at Widdifield High School in the Gymnasium from 5-6:30 on the following Saturdays: March 23, March 30, April 6, April 13, April 20, April 27 and May 4 (if the fields are not open by then). Players are to wear gym clothes, indoor shoes and be sure to bring a water bottle. Change rooms will be available to change before and after. If for any reason your player can not make a session, please let me know so I can let the coaches know. The purpose of the indoor training is to get the players moving, meet their coaches, learn some new skills etc… As once the fields open, we usually only have 2-3 weeks before our first game to put everything in place to prepare for the first game.. PLAYER FEES: As you know the cost for the season is $600, plus there is a $50 insurance fee that has to be completed online (more info on this coming soon). Payment is due in full by June 1, 2019. A deposit of $200 must be paid prior to equipment being handed out. For every $100 you have paid before the parent player meeting on the 20th you will get a ballot in an early bird draw to win a bike valued at over $800 (donated by Hopper Buick GMC). A big thank you to Hoppers for their ongoing support of the Bulldogs. The fee includes travel to and from away games, equipment (accept for mouth guard and cleats). On away game days, we usually bring a boxed lunch or breakfast depending on game times and we usually stop for lunch or supper on the way back at an enroute so they will need a little bit of money for purchasing lunch or dinner or some prefer a boxed lunch. We suggest $200 by April 1st, $200 by May 1st and $200 by June 1st, but we are accepting payments now in order to spread them out a bit more. Ways to pay registration fees: email transfer is the most popular these days and you can email me at christa@d-linsurance.com. Source for Sports on Fisher Street also accepts payments and registrations, there you can pay by cash, cheque, credit or debit card. Or in person at in gym sessions by cash or cheque. For home game days we have a game day booklet and you can go to the community to offset your player fees. The first $100 you collect in sponsors will go the club. Any sponsors you get after the $100 can be applied to your player fees. For example, if you get $700 in sponsors $100 goes to the club, $600 to player fees, or if you get $300 in sponsors the first $100 goes to the club, $200 towards player fees. If you are interested in this option let me know and I can send you the costs for sponsors. Bingos, we have a Bingo spot every second Saturday which if you volunteer, we can reduce player fees, please let me know if you are interested in this option. Kidsport and Jumpstart programs are available as well. Apply now to be sure to get approved. GAME DAY VOLUNTEERS: Game Day, we are always looking for hydration crew, trainers, stats, film people, photographer for home and away games plus for home games we are always looking for help for things such as field set up and take down, working our BBQ, front gate (collecting entry fee of $5, selling 50/50, pop chips, clothing), and DJ/announcer and stick crew. If any of these things interest you let me know and I can add you to our list. The Senior Varsity 2018 championship rings are in. 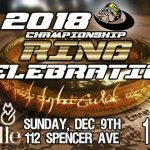 We would like to have a celebration on Sunday, Dec 9th hosted at the Fox and Fiddle. The festivities begin at 1 PM so we encourage all our players and fans to come out and share in the moment with our reigning-defending champions. The Fox and Fiddle venue is located at 112 Spencer Ave, North Bay. The Bulldogs look forward to seeing you there. Equipment hand out is Wednesday, August 22 from 6-8 or August 26 from 4-6 at Krown Rustproofing on 514 Gormanville Road. Tyke Camp (all tykes at once) August 27 and 28 from 6-8 at Rolly Fisher field in behind Memorial Gardens. PeeWee Camp (all peewees at once) August 29 and 30 from 6-8 at Rolly Fisher field behind Memorial Gardens. We will divide the kids on to the four teams and you will receive an email from your head coach as to which team your player is on and they will give you information as to when and where and times for practices for the season. Once your young star is placed on a team you will receive a call or email from the head coach of that team advising which days, location and times your team will be practicing at. September 15, 22, 29, October 4 and 10 (under the lights evening games), October 13, October 21 semifinals, October 28 Championship game. Followed by year-end banquet October 28th. Should you wear a cup? No, a cup will hurt more than with no cup. Most people will wear underwear or tight shorts under their pants. Pants can be washed but should be hung to dry. Players should always come to practice in full equipment and bring a water. Always remember to keep your mouth guard in your mouth while on the field. If you forget your mouth guard you can not play. Do we still practice in the rain? Yes, we do, rain can be fun and we only stop for lightning. Once on a team, the players will all get their game jerseys which will be worn for practices as well. Until they receive the jersey, they can put a t-shirt, or jersey over the pads for this week. 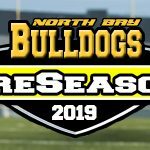 You can go to our online store http://northbaybulldogs.com/shop/ to purchase a variety of clothing, including our bulldog’s football equipment bags. Orders can take up to two weeks to come in. Orders are placed every Friday. 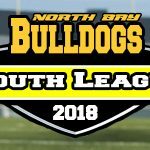 We have a Facebook page that people will share photos, information etc… North Bay Bulldogs Youth Tackle Football, join today! For those that did not get equipment, we will have some with us at the field, but you can still participate without it. There may be a couple of things you can but most will be ok.